Hoping this is the right place to look for advice on how to proceed with my game. I haven't played this in about two years, shortly after Light of the Spire released. I've only won a few games, one co-op, one regular, and one with Fallen Spire, all on 7/7 with Easy AI's. I'm trying to get back into the game and have been reading a lot of forum posts and wiki articles and it's time I reached out for help. It appears that my old strategy of playing doesn't seem to work as well. The wiki seems to imply that high AIP is no longer as winnable as it used to be. I remember the two games that I won, the AIP was somewhere in the 350-400 range before attacking the AI Homeworlds. It seems like that is no longer such a great idea. Also, most of my conquest strategy revolved around 1) take in raid starships to kill guard posts, then 2) send in blob of death to clean up. That worked pretty much the entire game. Of course, in the span of 2 years, lots can/have changed. So, before I get into my specific game, I guess I have a few questions. 1) What changes have occurred after LoTS that cause such a difficulty jump now in AIP? It seems that my old strategy of just taking several early worlds, creating a few bottlenecks, and then extending from there may not work as well as it used to. I'm currently at work so unable to provide a screenshot or save file, but I'll try to do so once I return. Just wanted to see if I would get any thoughts by the time I get home to continue my game. Current Settings & status from what I remember. I think I'm playing a 100 planet Simple map. Disabled most of the "harder" options. Left Zenith Trader on, Fallen Spire campaign on, and the spirecraft/golems are all at medium. I'm currently trying to play a low AIP game. Maybe a bit too low for what I need to beat it, but I figured it couldn't hurt too much. My current status is the following. Captured 2 planets around me, creating a triangle connected territory with several wormholes that are all currently defended pretty much with static defenses only. I captured a third planet 3 jumps away with an Adv Factory on it (maybe too early to do so, I have nothing Mk3 unlocked). Along the way, I have neutered every single planet that is next to my territory. I've found 3 of the Co-Processors, but trying to find the last before hitting them. My AIP is currently around 18 and I'm just under 3 hours game-time played. I've used up every bit of static defense I have to defend ALL the wormholes that currently are in my territory. I've got 2 ARSes that are nearby which I'm planning on taking soon, however, I won't have the turrets available to defend those planets. I've currently unlocked Grav turrets, Tractor Mk 2, Metal + Crystal Mk 2/3, Raid Starship Mk 2, Scout Mk2, Hardened FF1. And I think that's about it. I'm actually amazed at what I've been able to do with just the starting starships and Mk1 fleetships. I guess what I'm looking for is a what now? I think I've got ~6k knowledge maybe a bit more, I'd have to check tonight. My original plan was to just unlock Mk2 turrets and continue taking solitary planets which are beneficial, and try to just leapfrog into the AI worlds and neuter a path along the way so I can still travel relatively safely. 1) I know I'm probably being a bit too obsessive about the low AIP in this game. Should I start killing some of the warp gates in adjacent planets so that I can lower the number of turrets defending each wormhole and use them elsewhere? 2) If I unlock more turrets, back to my earlier question, what will I need in order to beat the AI? Will I need to ultimately unlock Mk3 of the Triangle Fleet? Should I do it with Starships instead? I'm tired of trying to win with a Blob of death so that's why I'm trying this more defensive cherry picking planet strategy instead of massing a blob. I'm relying pretty heavily on the starships now, but should I focus on getting higher marks there and doing the same surgical strikes with starships on the homeworld and cleanup with a transport or two full of fleet ships? 2b) Short version of above question: The low # of planets I'm taking is making knowledge tight. How much should I be investing in the defensive turrets vs offense, and should I be investing more in the fleetships or starships? 3) What is a good AIP to be at before attempting to take out one of the homeworlds? 5) There are several planets in which I have found the Mk 5 fabricators. Are they worth capturing and using with my current strategy? I know a lot depends on the ship type and how defensible it is, but just looking for some general guidance. Thanks in advance to anyone that replies. I'll try to update with more info when I get home, but wanted to get some discussion going in advance. 1) Depends on whether you use more mobile or more static defences (fleet or turrets, so to speak). If you use turret-based defences, then keep those turrets there and leave the Warp Gates alone. The system WILL be attacked sooner or later by CPAs, Exo-Waves, loose threat...just eliminating normal waves is not worth the AIP increase. However, if your defences rely on quickly moving around the fleet to respond to enemy incursions, then it might be worth it. 2) Unless the AI type is a strong counter to a particular type of ship, or you just really really like Starships, I recommend diversifying a bit. You never know what the AI might throw at you, so its good to cover all the bases. Bombers are always a good pick, for example - no matter what kinds of ships are flying around, you WILL have to destroy some heavy structures. 2b) If in doubt, invest in mobile ships. You can still use them for defence, but trying to attack with turrets is a bit...nauseating. 3) AIP should be such that you can handle incoming waves without having to commit your fleet to defence, to free it up for the assault. As long as you can easily beat back waves, you're good. 4) Neutering enemy planets is almost always a good idea, unless you can't afford it economically or there's a Raid Engine (or something similarly dangerous) nearby. If you can't afford to build enough turrets to defend a system you've already taken, then I'm afraid you probably overstretched a bit. Either invest knowledge in defences, split off a piece of your fleet to beat back the enemy, or try to free up some turrets by capturing strategically well-positioned planets. 5) If it were me, I'd take a good look at the unit produced by the Fab, consider whether I actually have use for its particular abilities, and base my decision on that. Unlocking Tanks when you already have mkIII bombers, for example, is fairly pointless (unless you really need to crack down on enemy fortresses). Core Turret Controllers: half-cap MKV turrets on almost every planet (probably not your chokepoints). Showdown Devices: Stalemate Breakers, for better or worse, if the AI Homeworld is just too well reinforced and unavoidably alerted. Reduced Knowledge Costs: help everyone, but the player more than the AI. It is much more viable to have both MKIV Starships and Constructors. Improved wave interval for multiple points of entry (more consistent size, smaller waves more frequently). What makes high AIP games difficult right now? I'd say low cap ships. Since CPAs go by total ship count only, a Stealth Master high AIP assault is a scary thing (100+ MKII/III stealth battleships). If it was actually up for discussion, I'd propose a "# of Fleets" gotten by dividing the CPA number by your standard (96) fleet cap, and then report that. If a CPA would generate 960 ships, then the CPA would report a "CPA incoming: 10 Fleets", then instead of 100 Spire Stealth Battleships, the most you could face would be fifty. But... in hindsight, if only 10-20 spire stealth battleships showed up, that would be kind of sad, so maybe not a strict conversion of caps. 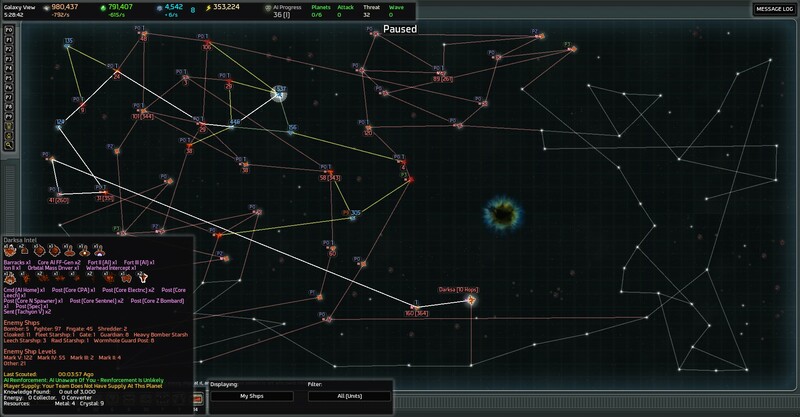 Given a Vanilla and Entrenched Homeworld AI type and multiple points of entry, I would suggest Logistical Command Stations (MK2+), and higher marks of Riot Starships. Go out of your way to find and control the Core Spider Turret Controller for 49 spider turrets in every border system. Miniforts are nice, but better with a military command and spider turrets bouncing ships back. It's still going to be rough, but I'm handling the 350 AIP waves against a Feeding Parasite and Stealth Master right now just fine. It is the Stealth Battleships that are giving me nightmares, though the other ships are no laughing matter. It isn't perfectly viable, but I like to have MK1 Riots equipped with shields and tractor turrets. I have them haul ships away from the command then go 'standby' to untractor them. Note that ships can always hit whatever is tractoring them, regardless of distance. Tractoring away bombers ends poorly for Riot Starships (unless you're using merc etherjets I suppose). Oh, yes, a lot of things have changed. Two expansions, and some major changes to the base game. You may have noticed, for example, that AI Guardposts are now much nastier than they used to be, and starships got a major upgrade - Raid Starships included. The Mk II and Mk III especially. The Fallen Spire campaign has changed a little, too. Later shards now move faster, but have higher AI response. The shards also now spawn at a fixed distance from the homeworld, not a distance into AI territory - this makes it a little less predictable as to where they will spawn. Knowledge costs for Mk II and Mk III ships and turrets have been lowered. The higher mark Starships also cost less, but they received major stat upgrades as well. Take a look at the new Neinzul Enclaves, for example. They are no longer mobile space docks, but automated drone producers instead. In general, the AI got a boost in response to AIP. The human player has received a bunch of bonuses to compensate, but it doesn't change that the AI gets more ships for most things over what it did right after LotS came out. That strategy will still work for the general case, but it isn't as powerful as it once was. The economy also got a significant boost - both Harvesters and Stations. It is no longer as necessary to grab an extra world or two right away for the resources. This makes it a little easier to keep AIP down. Energy got a rework as well, the net result was to make it more important and less fiddly. Each system can build 1 free Energy Collector that gives 150,000 energy, but for additional energy you need to build Matter Converters that give 50,000 Energy but cost -100/-100 Metal/Crystal. Keeping a large energy reserve, or recovering from a brownout, can be economically costly and time consuming. 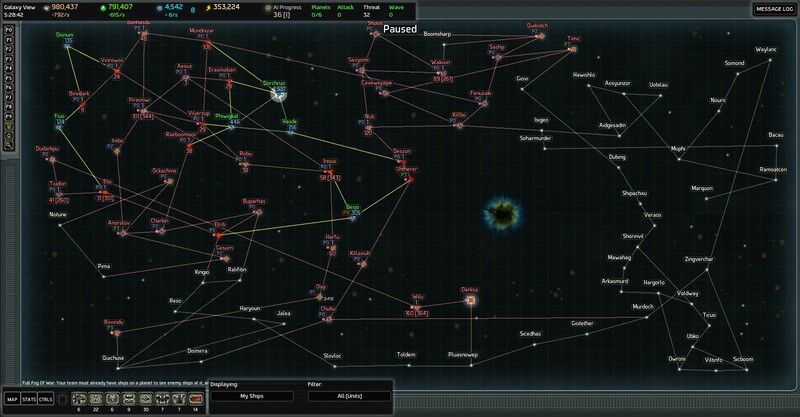 Be careful of your Energy level if the AI looks like it might take out a system or two, as without fixed defenses or forcefields it can easily cascade into losing multiple systems. I don't know when you last played, so you may be unfamiliar with how ARSs have changed. First, capturing an ARS no longers unlocks both the Mk I and Mk II of a ship. Now it unlocks only the Mk I, but also gives 500 knowledge as well. Second, each ARS can unlock one of three ship types. You can view which ships will be unlocked by sending a Science vessel to that system. Mk II Science ships are useful for this. Select the Science vessel, then on the ARS tab, you'll see three ships. By default, the leftmost ship is the one that will be unlocked. However, you can use the Ship-Design Hacker vessel to hack the ARS and take your pick of the three ship types. The AI responds forcefully to this sort of thing, so be prepared. Hacking must be done BEFORE killing the AI Command Station. I suggest you send a Mk II Science vessel in to the ARS systems ASAP to find out what ships are available. Personally, I like to limit the AI to 1-2 systems it can send waves to, and no more. If possible, I will restrict where there are ANY AI access points, as CPAs are now much more dangerous than they were 2 years ago - they tend to group up more, better evaluate the human defenses, and are able to re-direct if a weaker human target system is available. And most dangerously, freed threat won't just sit forever at one wormhole. It will now pull back into AI territory and wait for a good target. This can make it very difficult to clear out threat sometimes, so it's best to never let it build up to begin with. 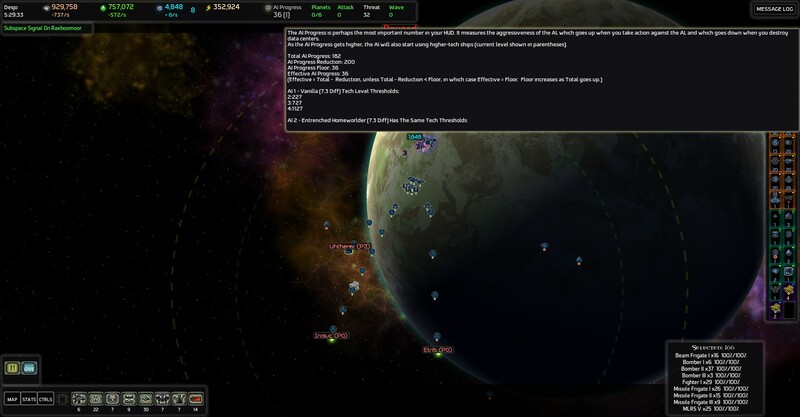 The AI Homeworlds have a number of defensive reactions that assume a roughly 200 AIP. Attacking with less AIP than that means giving up something without having lower the AI defenses. No, neutering planets is just as important (or more so) than it ever was. Gate Raiding is also still important. The Warp Jammer Command Station is very useful for protecting things like your Adv Factory - it prevents the AI from sending waves to that planet AND it stops the human system from putting adjacent AI worlds on alert. Lower reinforcements and less threat is a great thing. I'm sure there is more that's changed that I just can't think of as important right now, sorry. To a certain extent, there's enough different stuff that you'll need to play a bit and relearn it all yourself. But if you have specific questions, or can post screenshots/saved games, it's easier to comment on specific situations. Thanks for the responses all. That does give me some guidance and explanation as to what some of the differences are. Anyway, I promised a few things which I'm a bit late on delivering, but here it is. I've never really done one of these before so I'm not sure what the proper protocol is aside from me just putting some SS's along the way. I've got my little triangle defense at Dorchruo/Phiwigkal/Hasde. I captured an Adv Factory (still unused) at Disnuni, and 2 ARS at Fiuo and Desjo. They provided me with a Raider and I can't remember what the other is now... At the Adv Fact, is also a Mk5 MLRS factory, along with a Botnet Golem. It was a very loaded planet. I haven't activated it yet, but I'm thinking I may need to soon. I should be able to handle the +100 AIP given my AIP is currently hitting the floor with room to spare. I've got room to take another 3 planets before I even really pierce the floor. Right now I don't have any other high priority targets. I'm in the process of neutering the planets around Desjo, and then going to see if I can start carving a scouting path into the eastern part of the map. Rovindo, in the south west marked P3, has a Cursed Golem that I can attempt to repair as well if I feel the need for it. I've found one of the Homeworlds, and here's what's in it. Honestly, I have no clue how I'm going to break through it yet. I've got Bombers MK2 unlocked, unlocked most of the basic Mk2 turrets, Grav 2 turrets as well. After I find another 3 planets or so to take, that should put me at about 15k additional knowledge to spend. It seems like that repairing the Cursed and Botnet golem may be my best shot at trying to take out the homeworlds. I'm curious as to what some of the other low AIP games use to break through the Mk4/5 defenses of the AI Homeworlds? Also, for those who are curious/care, attached is the save file so far. Cursed golem is great, but... strictly speaking, underpowered in a HW assault, IMO. It spreads its 1.6 million damage per second out too wide when enemies like zenith bombards have 1.8 million health at mark V. It can be quite useful in taking down even core guardians and is relatively cheap, but the Artillery golem is better suited at that point - and ignores raider dampening, letting it fire on any target, even though it can only take fire on one target. Off the top of my head, I believe the botnet golem is completely unable to attack core units, and the homeworld has a Hive Golem countermeasure. Artillery, Armored, Black Widow (for the paralysis), Regenerator golems would be my choice for the homeworld assault. If it wasn't for planetary tachyon coverage on home commands, I'd recommend Spirecraft Penetrators. I'm not familiar with the Core Sentinel Guard Post, but since it is mobile, it would be relatively simple to hit with a Spirecraft Ram. If I was doing the entire system without any minor factions, I'd take advantage of MKIV fleetships, transports, and the fact that most if not all of these guard posts have a three hour regen time and the AI gets no engineers. Assault transports for instant unloading, or just a bunch of regular transports so the unloading is done sooner than later. I'm currently near 400 AIP in (fortress mentality) my game, the toughest part so far is the CPAs... if I mess up fleet maneuvers I spend a lot of time rebuilding and getting myself that much closer to the next horrifying CPA. Spirecraft Attritioners are a huge helping hand dealing with swarms.